Elijah has spoken God's Word to the wicked King Ahab regarding a three year drought. Elijah stood alone with God against the wicked King Ahab and all the wickedness and idolatry surrounding him. 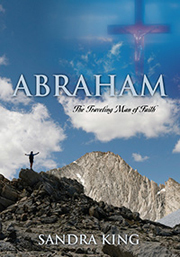 Elijah has been used to show God's greatness and power over any false god. Jesus did this on the cross. He disarmed Satan and his wicked demonic host. Then God instructs Elijah to go to the brook Cherith east of the Jordan. Elijah must leave the land full of wickedness and get alone with God. There God will supernaturally feed Elijah through a raven to prepare him for his next mission. Cherith means "to cut down." God hid Elijah away and cut him off from all others. Elijah must learn to trust God in all things. He must also be pruned of anything that will come in the way of Elijah's calling. So God took Elijah to a place away from all others and all that might steal his attention which would hinder Elijah from fulfilling his greater purpose. At the brook, there was no one but God that Elijah could lean upon. God is preparing Elijah by feeding him bread, meat and water, and is removing all that will hinder his God-ordained purpose. The bread, meat and water represent the Anointed Word. It is the Anointed Word --both the written and the Living Word Jesus anointed by the Holy Spirit-- that will cleanse us of defilement if we obey it. "He cuts off every branch in Me that bears no fruit, while every branch that does bear fruit, he prunes so that it will be even more fruitful." John 15:2 Elijah needed further pruning. The Law regarding pruning the vineyard for six years is in Leviticus 25:3. This is about an earthly vineyard. Jesus is talking about the Vine and the branches in John 15:1 Jesus takes the "natural" into the "spiritual." Jesus is talking with His disciples about Himself as the Vine and those who follow Him as the branches. He speaks of pruning the branches (believers) so they will bear more fruit. A raven is an unclean animal according to the Law. (see Leviticus 11:15) It is a flesh eating bird. God uses the raven in the reverse of its nature. Ravens are solitary and selfish. Instead of eating the flesh of Elijah, God will use the raven to supernaturally feed His prophet bread and meat. God operates in the spiritual which is the reverse of the natural. He can change the character of a bird, animal or person to accomplish His goals, just as He can change the character of those who love Him so we will accomplish His goals for our lives. The bread and meat of the Word will remove His prophet's fleshly nature so he will walk in the character and authority of God. The brook will provide water--the anointing. The Jews also considered gentiles unclean unless they converted to Judaism and went through a cleansing process. With God all things are possible! God would use an unclean bird to feed His Jewish prophet. Then God sent Elijah the Jew to an "unclean" gentile woman for further feeding and refining. Throughout the Older Testament and the New Testament, God used both Jews and Gentiles to advance His kingdom. It is, was and will always be God's plan to unite Jew and Gentile as one Body of Christ to advance His kingdom on earth as it is in heaven. In order for this to happen, however, we must come to agreement upon Truth. Confused truth will not unite! It divides. So God wants us to come to the knowledge of the pure Truth. This will take laying down our preconceived notions of truth based upon our upbringing or denomination, and allowing God to show us the truth through Jesus and the Spirit of Truth. James assures us that if we ask for wisdom, God will give it to us. We must be sure we are rightly-dividing Truth. At God's direction, Elijah goes to Sidon. There he meets a poor, humble gentile widow who was gathering sticks to make a fire to bake bread. Elijah asks this woman for a drink of water. Elijah had left Samaria (territory of the Northern tribes of Israel) because Ahab and Jezebel want to kill him and is now in Sidon. God sent Elijah to the very country that the wicked Jezebel was from to prepare His prophet further to take on the forces of evil. No doubt Sidon was safer now because the wicked Jezebel is now in God's land sadly bringing His people into rebellion, idolatry and sexual immorality. Sidon would be the last place Ahab would think Elijah would be! A scripture in the New Testament that is similar to Elijah and the widow that he asks for water is in John 4. Jesus has left Jerusalem because they were plotting to kill Him and goes to Samaria. There He meets a Samaritan woman at Jacob's well. He asks her for a drink of water. It was unheard of for a Jewish Rabbi to even go through Samaria let alone ask a woman for a drink. The Jews considered the Samaritans unclean because they had intermarried with the people of Jezebel who were Baal worshipers from Sidon. There was hatred and animosity between the Samaritans and the Jews. Jesus would break down all hatred, gender and racial bias in His actions with this Samaritan woman at Jacob's well. Jesus loved both the Jew and the Gentile, male and female, young and old throughout scripture. He illustrated this in the story of His encounter with this Samaritan woman. Elijah also showed no bias or animosity toward this gentile woman to whom God sent him, nor this gentile woman to him. The message that God is conveying in the accounts of Elijah and the widow of Zarephath and Jesus and the Samaritan woman at Jacob's well is that God wants the Jew and Gentile to come together as "one new man" as Christ's Body. It doesn't matter whether we are Jew or Gentile, male or female, young or old in the eyes of God. What matters to God is that we accept the finished work of His chosen and precious Son Jesus so we are restored to Our Heavenly Father for all eternity. We don't come to God through Law but through Christ's love and grace. If we think we can do some ritual or obey some rule to gain eternal life, we have been deceived. Only sinless blood can atone for sin and give eternal life. As Elijah obeyed God out of His love for Him and His people as well as this gentile widow and her son (young and old), we are to obey Jesus out of our love for Him and others. Elijah had no problem going to Sidon and this gentile woman because God told him to. Elijah is faithful to His God. In the midst of this Baal worshiping territory, this gentile woman obviously believed in the true God. God is no respecter of persons. We are all equal at the foot of the cross of Jesus. He died for us all. The fact that this gentile woman was willing to go and get Elijah the Jew a drink showed Elijah that she was the woman God had told him about. During these times and even in the time of Jesus, it would be unheard of for a true Jew to ask a Samaritan or gentile woman for a drink. Keep in mind that God had also told this woman that His prophet would come, and she was to feed him. God is in control in this situation. As the woman of Zarephath was going to get Elijah a drink of water, Elijah asks her to also bring him a piece of bread. There was a famine in the land and bread and water were scarce. No rain, no grain. No rain and the brooks dry up. This would be no easy task because of the famine. As a matter of fact, this gentile woman was down to her last handful of flour and a little oil in an earthen jar (vessel). Little is much in God's hands. She was gathering sticks to start a fire to make a meal for her and her son, and then die. She has lost hope. But God.......hasn't forsaken His Jewish prophet or this gentile woman and her son. When Elijah tells the woman to bring him a piece of bread also, she is honest with God's prophet. She doesn't have any bread, but she has the makings for some unleavened bread! She has only a handful of flour and a little oil in a jar--enough to make one last cake for her and her son. Elijah tells the woman to go and do as she said, but first make a small cake and bring it to him. Then Elijah prophesies to this woman, "For this is what the Lord, the God of Israel says, 'The jar of flour will not be used up and the jar of oil will not run dry until the day the Lord gives rain on the land.'" 1 Kings 17:14 All who believe in Jesus also have the makings for unleavened bread! We are His earthen vessels who have the Word (grain/seed) and the oil (Holy Spirit) to make unleavened bread (pure truth) and feed it to others for spiritual life. Like this woman, we must mix the grain (Word) with the oil (Holy Spirit) and seek pure truth to feed others. Making bread was laborious in Elijah's time. Getting to the pure Truth is also laborious. Because the Word is Divinely inspired, it is Divinely interpreted. Scripture interprets scripture. The Bible says we are to study to show ourselves approved. Study takes time and hard work, but it is worth doing so we can teach God's unadulterated, pure Truth. It is the Truth that sets the captive free! This gentile woman heard God's Word, received God's Word, believed it and acted upon it. Her faith and obedience brought a never-ending supply for the Jew (Elijah) and the gentiles (her and her son). The flour and the oil never ran out. God's Word and the oil of the Holy Spirit anointing are never used up. They are eternal. God was withholding bread and water from His rebellious people, but providing bread and water for this gentile woman, her son and His Jewish prophet daily to sustain their lives. God used the story of the gentile woman and Elijah to paint a picture of what Jesus and the Holy Spirit will supply in the spiritual for all who believe in Him and His finished work on the cross whether Jew or Gentile. Next we will see that this woman's son gets sick and dies. God will use Elijah to impart new, resurrection life into her son.